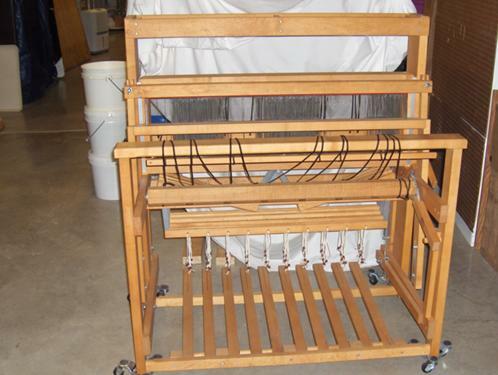 For Sale: Schacht 36" standard floor loom, eight harnesses, high castle, maple wood. • High castle has handy storage and two lamp holders. • Stainless steel heddle bars and 1000 inserted eye heddles. • Stainless 6 dent reed. • Easy tie-up system with pre-measured cords that slide into a slot from the back of each treadle. • Removable breast and back beams for ease in threading. • Friction brake on the warp beam and ratchet brake on the cloth beam. 44 inches wide, 38 inches deep, 46 inches tall. Loom can be ‘folded’ back to front to save space for storage. Approximately 135 pounds. Loom in excellent condition, has seen little use. Adjustable height from 19” to 24" with a 30" by 10" seat surface. The seat can be fixed flat or at a slant and has an open storage bin below. Approximately 22 pounds. Can be used on a table or counter top or set on the floor. The mill has a 72” circumference and can wind an 18 yard warp. A horizontal mill eliminates the back-and-forth action of a warping board and puts less strain on your shoulders. 36” wide, 25” deep, 34” high. Approximately 18 pounds.